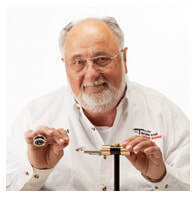 Developed by professional research engineer and fly tier Norm Norlander, the Norvise – Fly Tying Vise, and Automatic Bobbin are truly innovative tools. Unlike other “rotary vises” that simply “rotate” to position the hook, the Norvise is designed to “spin” the hook to apply material. With the hook shank held in perfect alignment with the axis of rotation (on centerline) it works like a lathe and provides for better thread tension control and more precise material placement. Precision ball bearings and heavy brass hubs enable the Nor-vise to also work like a spinning wheel for dubbing like you have never seen before. Perfectly shaped and textured bodies, with all the dubbing materials, can be created, without wax, better, faster, and much easier than by any other method. Lots of other body materials such as lead, wire, tinsel, floss, chenille, plastics, etc. can also be “spun on” very quickly and smoothly. Another unique technique with the Norvise is to use its spinning capability to “reinforce” materials such as herl and hackle with the working thread. The Norvise Fly Tying Vise Bobbin solves the problem of getting the bobbin out of the way, yet instantly having it right back to where it is needed. Holding the thread in alignment with the hook shank (on the Thread Post) the vise may be rotated or spun to wrap on materials without adding additional thread to the hook. Like any new technology it takes a bit of practice to master, but you can, and you will then wonder how you ever did without it. The Norvise – Fly Tying Vise and Norvise Fly Tying Bobbin will indeed “Tie Better Flies Faster”.